This application protocol describes the separation of oligodendrocyte precursor cells based on the expression of CD140a, or platelet-derived growth factor receptor alpha (PDGFRα), which is broadly expressed in embryonic tissue, various malignancies and embryonic stem cell-derived cardiomyogenic cells1,2, and specifically expressed by oligodendrocyte precursor cells that differentiate into myelinating oligodendrocytes.3–5 The isolation protocol has been tested on dissociated postnatal CD1 mouse brain tissue derived from animals younger than postnatal day eight (P8). In principle, cell isolation is also possible from older mice, but purity of the positive fraction might be lower due to a lower frequency of CD140a (PDGFRα)-positive cells after tissue dissociation. For optimal results, we recommend using the Neural Tissue Dissociation Kit (P). The following is a listing of reagents, instruments, and consumables needed for each step of this protocol. These products are for research use only. (Optional) ART® 1000 REACH™ pipet tips (Molecular BioProducts, Inc.) for removal of dissociated material from the closed C Tubes. Fluorochrome-conjugated Labeling Check Reagents to stain labeled cells for flow cytometry analysis, e.g., Labeling Check Reagent-APC (130-098-892), or Labeling Check Reagent-PE (# 130-095-228). Learn more about our antibodies and dyes. ▲Note: The use of CD140a antibodies, clone APA5, is not recommended for analysis of cells that are labeled with CD140a (PDGFRα) MicroBeads. Propidium Iodide Solution (#130-093-233) or 7-AAD for flow cytometric exclusion of dead cells. PB buﬀer: Prepare a solution containing phosphate-buﬀered saline (PBS), pH 7.2 and 0.5 % bovine serum albumin (BSA) by diluting MACS BSA Stock Solution (# 130-091-376) 1:20 with PBS. Keep buﬀer cold (2-8 °C). Degas buﬀer before use, as air bubbles could block the column. ▲Note: BSA can be replaced by other proteins such as mouse or rat serum albumin, mouse serum, or fetal bovine serum (FBS). MACS Columns and MACS Separators: CD140a (PDGFRα)+ cells can be enriched using LS or MS Columns. Positive selection can also be performed using the autoMACS Pro Separator. ▲Note: Column adapters are required to insert certain columns into the VarioMACS™ or SuperMACS™ II Separators. For details refer to the respective MACS Separator data sheet. Staining buffer: Prepare a solution containing autoMACS Running Buffer (# 130-091-221) with FcR Blocking Reagent, mouse (# 130-092-575) in a ratio of 1:10, e.g., add 1 mL FcR Blocking Reagent to 9 mL autoMACS Running Buffer. Adjust cell culture times to meet your experiment objectives. This protocol includes detailed instructions for preparing necessary reagents and materials and then carrying out each step. PB buffer: Prepare a solution containing phosphate-buffered saline (PBS), pH 7.2, and 0.5% bovine serum albumin (BSA) by diluting MACS® BSA Stock Solution 1:20 with PBS. Keep buffer cold (2−8 °C). Prepare fresh on the day of use and degas the buffer, as air bubbles could block the column. ▲ Note: BSA can be replaced by other proteins such as mouse serum albumin, mouse serum, or fetal bovine serum (FBS). Coat a 24-well culture dish with 0.01% Poly-L-lysine overnight at 37 °C. Wash three times with ddH₂O the following day. Prepare the following cell culture medium: MACS Neuro Medium containing 2% MACS NeuroBrew®-21, 1% penicillin/streptomycin and 0.5 mM L-glutamine, 10 ng/mL Human PDGF-AA, and 10 ng/mL Human FGF-2. Dissociate mouse neonatal brain using the Neural Tissue Dissociation Kit (P) or Neural Tissue Dissociation Kit (T). Follow the protocol of the kit data sheet. Isolate oligodendrocyte precursor cells using the CD140a (PDGFRα) MicroBead Kit, mouse. Follow the protocol of the kit data sheet. To stain and analyze the isolated oligodendrocyte precursor cells by flow cytometry, follow the protocol of the data sheet for the Labeling Check Reagent. ▲Note: Use DPBS/BSA buffer instead of the buffer described in the data sheet. ▲Note: The recommended antibody dilution is 1:11 for up to 1×107 cells /100µL of buffer. Plate 5×104 cells in 50 µL of prepared medium as a drop in the middle of each well of a 24-well plate that has been coated overnight (see "Things to prepare in advance of cell isolation and cell culture”). Let the cells settle down for 30 minutes at 37 °C in the incubator. Carefully add 450 µL of prepared medium to each well. Maintain the culture by replacing 50% of prepared medium every other day. ▲Note: If oligodendrocytes are cultivated for longer periods, e.g., 2 weeks, we recommend increasing FGF-2 and PDGF-AA concentrations to 20 ng/mL instead of 10 ng/mL. 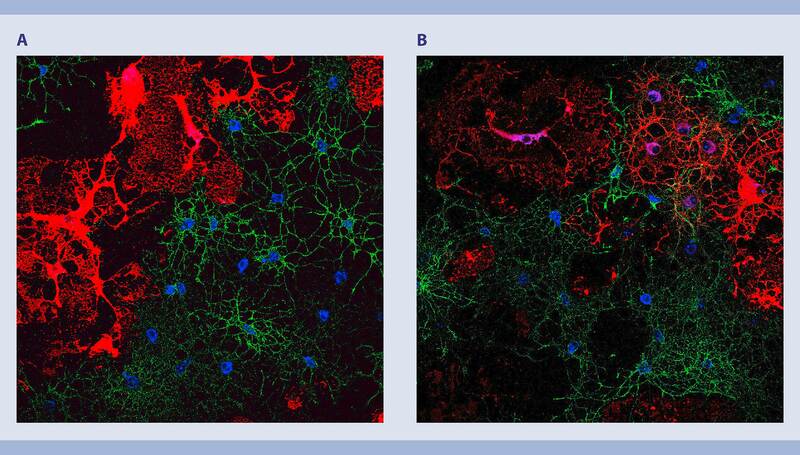 Cultured oligodendrocyte precursor cells from neonatal mouse brain tissue. P2 whole mouse brains were dissociated using the Neural Tissue Dissociation Kit (P). Subsequently, oligodendrocytes were isolated using the CD140a (PDGFRα) MicroBead Kit and CD140a-positive oligodendrocytes were cultured in MACS® Neuro Medium, MACS NeuroBrew®-21, 1% P/S, 0.5 mM L-glutamine, 10 ng/mL PDGF-AA, and 10 ng/mL FGF-2 on PLL-coated glass coverslips (5×104 cells per well of a 24-well plate). After 7 days, in vitro cells were fixed and stained with the oligodendrocyte-specific antibodies Anti-MBP (red) and Anti-AN2 (green); blue stain is DAPI. P2 whole mouse brains were dissociated using the Neural Tissue Dissociation Kit (P). Subsequently, oligodendrocytes were isolated using the CD140a (PDGFRα) MicroBead Kit, and CD140a-positive oligodendrocytes were cultured in MACS Neuro Medium, MACS NeuroBrew-21, 1% P/S, 0.5 mM L-glutamine, 10 ng/mL PDGF-AA, and 10 ng/mL FGF-2 on PLL-coated glass coverslips. After 7 days, in vitro cells were fixed and stained with the oligodendrocyte-specific antibodies Anti-MBP (red) and Anti-AN2 (green). Staining buffer: Prepare a solution containing autoMACS® Running Buffer with FcR Blocking Reagent, mouse in a ratio of 1:10, e.g., add 1 mL FcR Blocking Reagent to 9 mL autoMACS Running Buffer. Wash cells 3× with PBS. Fix cells with 2% PFA for 10 minutes at room temperature. ▲Note: Fixed cells can be stored in azide-containing buffer at 2–8 °C for up to 1 week. Add staining buffer (see "Things to prepare in advance") and incubate for 10 minutes at room temperature. Add Anti-O4 pure antibody in staining buffer to the cells with a final concentration of 5–10 μg/mL and incubate at room temperature in the dark for 10 minutes. Wash cells 3× with autoMACS Running Buffer. Add a corresponding secondary antibody (anti-mouse IgM) in staining buffer to the cells and incubate at room temperature in the dark for 10 minutes. ▲Note: For co-staining with additional antibodies repeat steps 6–9. Store cells in autoMACS Running Buffer. Cells are now ready for immunofluorescence microscopy. ▲Note: When working with cells cultured on coverslips, the coverslips need to be mounted onto slides before imaging. Heldin, C.H. and Westermark, B. (1999) Physiol. Rev. 79: 1283–1316. Takakura, N. et al. (1997) J. Histochem. Cytochem. 45(6): 883–893. Sim, F. J. et al. (2011) Nat. Biotechnol. 29: 934–941. Nishiyama, A. et al. (1996) J. Neurosci. Res. 43: 299–314. Nishiyama, A. et al. (2009) Nat. Rev. Neurosci. 10: 9–22. Unless otherwise specifically indicated, Miltenyi Biotec products and services are for research use only and not for therapeutic or diagnostic use. autoMACS, CliniMACS, the CliniMACS logo, CliniMACS Prodigy, CryoMACS, CytoMix, CytoStim, DendriMACS, ExiTron, ExpAct, FeraSpin, FeraTrack, GadoSpin, gentleMACS, LIFE 18, LIFE 21, MACS, the MACS logo, MACSductin, MACSelect, MACSfectin, MACSflex, MACSiBead, MACSiMAG, MACSmix, MACSprep, MACSQuant, MACSQuantify, MACSxpress, MidiMACS, MiniMACS, miRXplore, MultiMACS, NeuroBrew, NiraWave, OctoMACS, PepTivator, pMACS, PolySon, PrepProtect, QuadroMACS, REAfinity, REAlease, Rheo, StemMACS, StraightFrom, SuperAmp, SuperMACS, TexMACS, TheraSorb, thermoMACS, TransAct, Tyto, the Tyto logo, VarioMACS, Vio, Viobility, VioBlue, VioBright, VioGreen, Viscover, and µMACS are registered trademarks or trademarks of Miltenyi Biotec GmbH and/or its affiliates in various countries worldwide. Ficoll-Paque is a trademark of GE Healthcare companies. Vectofusin-1 is a registered trademark of Genethon. All other trademarks mentioned in this document are the property of their respective owners and are used for identification purposes only. Copyright © 2018 Miltenyi Biotec GmbH and/or its affiliates. All rights reserved.